The Genesis G80 has arrived, a rebadged and upgraded version of the previous Hyundai Genesis Sedan. The new model takes direct aim at the midsize luxury sedan market and does so with available well-equipped trim choices at very competitive prices. The Genesis G80 is a new model name and one of two sedans tasked with launching the Genesis marque. In reality, the 2017 G80 represents a refresh of the 2016 Hyundai Genesis Sedan. Besides the name change, the G80 reflects an equipment upgrade. Previously available active safety items such as lane keep assist, blind spot monitoring, automatic emergency braking, and adaptive cruise control are now standard. You’ll also find Android Auto and Apple CarPlay compatibility. 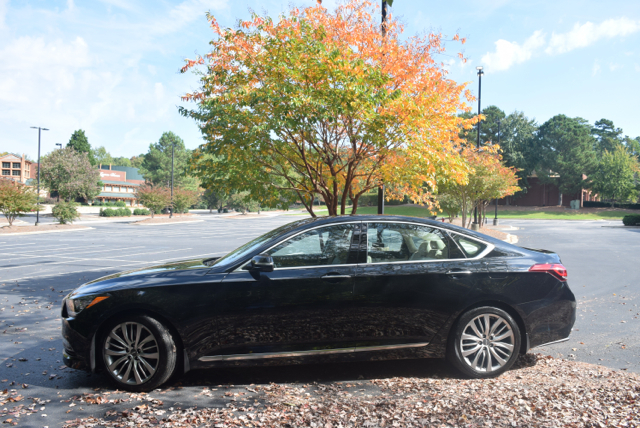 The 2017 Genesis G80 is offered in seven model or package choices: Standard 3.8 RWD ($41,400), Standard 3.8 AWD ($43,900), 3.8 Premium Package RWD ($46,150), 3.8 Premium Package AWD ($48,650), 3.8 Ultimate Package RWD ($50,350), 3.8 Ultimate Package AWD ($52,850), and a 5.0 Ultimate Package AWD ($54,550). Prices do not include a $950 destination charge. 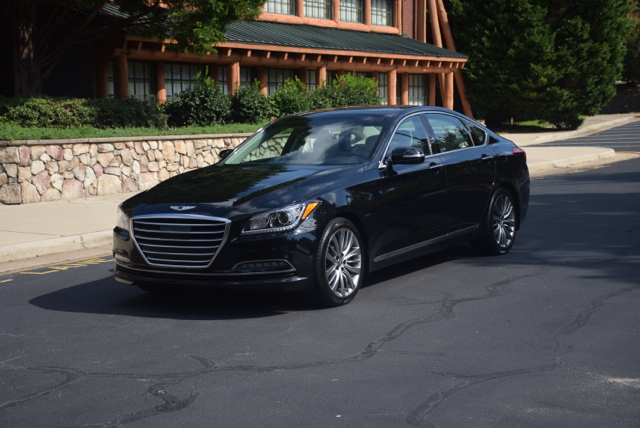 The elegant look of the previous Genesis Sedan returns, but with an updated grille and a new as well as more pronounced roofline. The sedan’s long sweeping lines and pronounced rear deck should remind you of similar European models with distinct profile creasing, rocker panel trim, and beautifully designed wheels adding flair and prominence. All models are equipped with premium alloy wheels — 18 or 19 inches. You’ll also find automatic projector headlights, auto-leveling headlights, LED daytime running lights, LED taillights, dual power folding heated side mirrors with approach lights, and dual or quad exhaust tips. The power trunk lid and front fog LED lights are optional. Midsize luxury sedans would be classified as large cars elsewhere and that’s exactly how the Genesis G80 measures up. This sedan offers honest to goodness room for five with excellent head, shoulder, hip, and legroom up front. In the rear compartment, leg room is a bit more constrained, especially if the driver’s seat is pushed completely back. This sedan also offers 15.3 cubic feet of storage space. 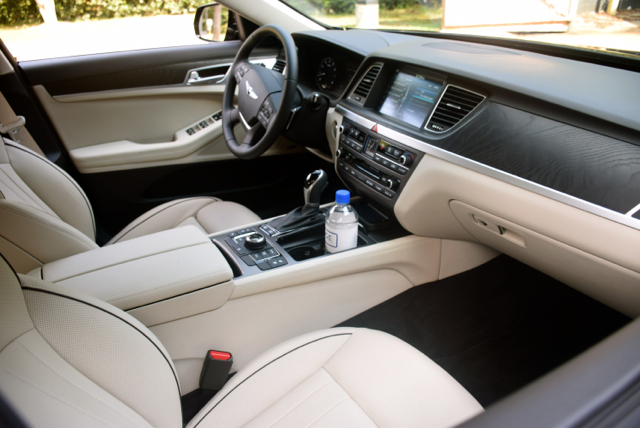 There is much to consider when examining the G80’s interior. As before, a large swathe of genuine wood trim covers the lower dashboard from the center stack to the rear door. 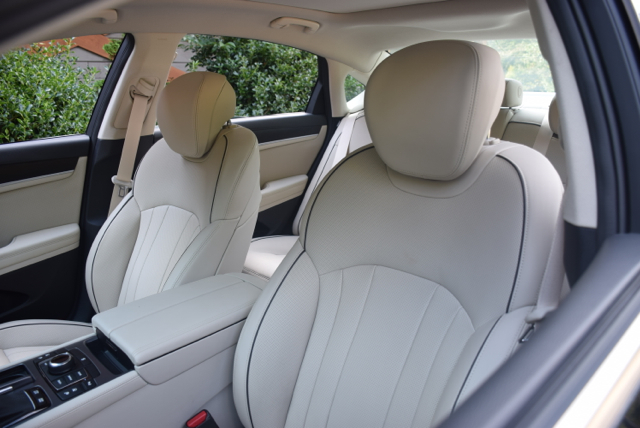 The seats are covered in available full-grain leather with twin stitching. Metal grain or aluminum accents and high-end soft touch materials only enhance the look. The 5.0 edition has more standard features; package upgrades on 3.8 trims may match most of what the top-trim G80 has to offer. Standard equipment includes a power driver’s seat with an extension, a power tilt and telescopic steering column, heated front seats, dual-zone climate control, and power accessories. Available features include a panoramic tilt-and-slide sunroof, ventilated front seats, heated rear seats, and a heated steering wheel. All Genesis models are covered by a five-year, 60,000-mile new vehicle warranty; a 10-year, 100,000-mile powertrain warranty; and a seven-year, unlimited mile anti-perforation warranty. Technology fans will automatically be drawn to the Genesis G80 and all it has to offer. One standard feature is the automatic trunk opening system that senses your approach and opens the trunk automatically — no need to kick your foot under the rear bumper. The available head’s-up display (HUD) provides such information as your speed, the local speed limit, audio system data, and advanced driver assistance data, including blind spot detection. All models include a proximity key for door unlock and push-button start. On the media and navigation fronts, an available 900-watt, 17-speaker Lexicon Discrete Logic 7 audio system is sure to please. This system rivals the best audio packages out there and includes Gracenote album art, voice recognition, and 30 GB of music download via USB. Integrated technologies include both Apple CarPlay and Android Auto. Fresh out of the gate, the 2017 G80 has garnered the Insurance Institute for Highway Safety’s Top Safety Pick+ award, its highest honor. This means the G80 received top scores in all five crash testing categories. The sedan also received a “superior” score for its standard crash avoidance & mitigation technology. Besides the previously mentioned driver assist technologies, the G80 comes with high beam assist and a suite of nine airbags. Other luxury sedans matching the G80’s top score include the Acura RLX, Mercedes-Benz E-Class, Volvo S80, and the Audi A6. 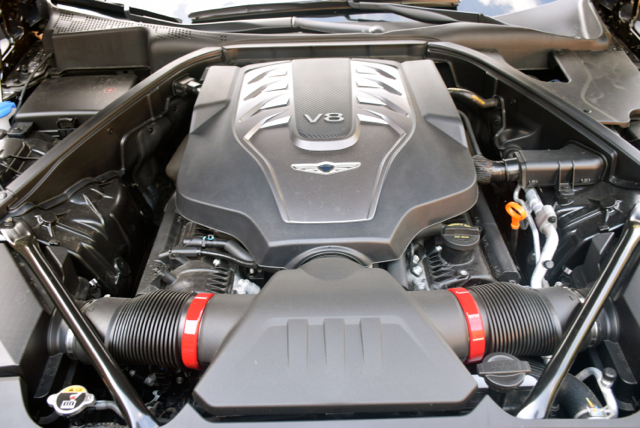 What do you expect to find under the hood of a midsize luxury sedan? A turbo-diesel engine? A twin-turbo gas engine? Typically, these two choices accompany the established European players, but neither are currently offered in the Genesis G80. Instead, you have a choice of two gasoline engines. Standard is a 3.8-liter V6 engine making 311 horsepower and 293 pound-feet of torque. Also available is 5.0-liter V8 engine creating 420 horsepower and 383 pound-feet of torque. Both engines are paired with an eight-speed automatic transmission. Only the V6 offers standard rear-wheel drive with available all-wheel drive. The V8 offers rear-wheel drive only. The EPA rates the RWD V6 at 18 mpg in the city and 28 mpg on the highway. The V8 comes in at 15 mpg in the city and 23 mpg on the highway. Yes, V8s are thirsty animals. Our test model was powered by the V8. It does everything you expect: excellent off-the-mark acceleration, strong passing power, and so-so fuel economy. This sedan is quiet, rides smoothly, and brakes firmly. Genesis says that the front shock towers of composed of aluminum, utilizing a diamond-strut bar for front structure rigidity leading to precise steering response. I concur that this arrangement does as advertised, enabling the G80 to navigate twisty roads with exactness. The rear features a multi-link suspension with an emphasis on enhancing lateral suspension stiffness and overall ride comfort. Buyers preferring all-wheel drive have no powerplant choice, but the V6 engine. The AWD system distributes torque between the front and rear axles, sending more to the latter operating in sport mode. In any case, all powertrain choices feature a four-mode drive mode system — eco, normal, sport, and snow. So, now we have Genesis. That’s one more luxury brand to consider on top of Lexus, BMW, Cadillac, Infiniti, Mercedes-Benz, Lincoln, Acura, Jaguar, LandRover, Volvo, and Audi. I didn’t even include Alfa Romeo, Porsche, Tesla, and a few other marques of distinction. Why consider Genesis? For a few reasons: it is a new brand, prices are reasonable, equipment levels are generous, and this marque isn’t like all the rest. Why drive something everyone else owns when you can be one of the first on your block to opt for the G80? At least that’s the thinking of some. On the other hand, if you want a diesel or performance model, you’re out of luck. At least for right now. Also, you’re limited to just two model lines and they’re both large sedans. Utility vehicles and at least one coupe will follow, but you can’t purchase one right now. At least not from Genesis. 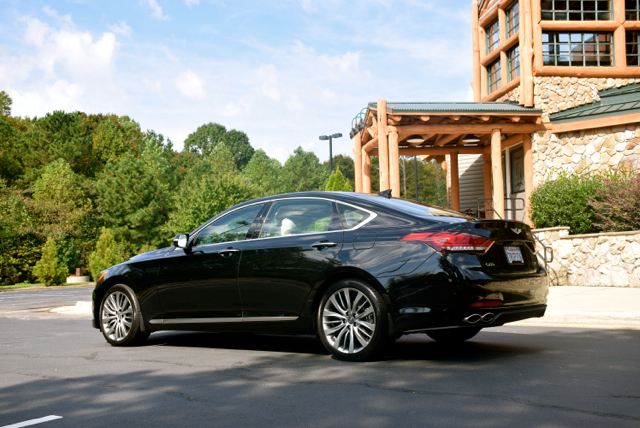 Some critics will point to Genesis’ Hyundai roots as if that’s a bad thing. It shouldn’t be, as Hyundai quality and resale values are sky high. Besides, didn’t we hear the same thing about Lexus when Toyota launched its own luxury brand more than a quarter of a century ago? In a few years Genesis brand cachet should improve, but be forewarned: prices may increase as well. In all, you can’t go wrong considering the Genesis G80, especially if you’re an individual who prizes independent thinking and appreciates the brand’s trailblazing in a highly competitive segment. This writer thinks Genesis will take hold and is confident that it’ll attract its own share of core followers. The brand won’t challenge the market leaders anytime soon, but that shouldn’t keep Genesis off your shopping list.